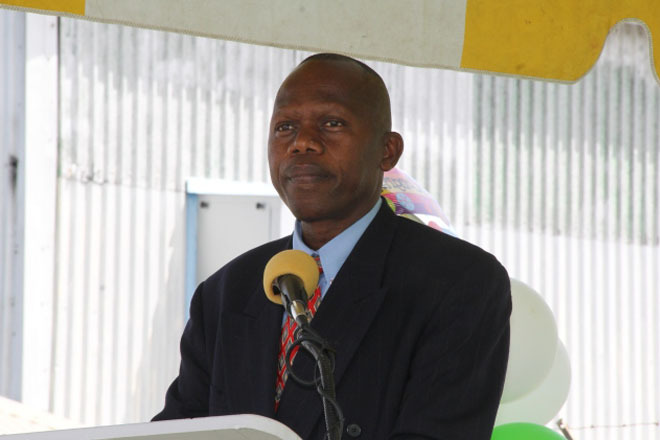 NIA — Acting General Manager of the Nevis Electricity Company Limited (NEVLEC) Mr. Jervan Swanston, says while the commissioning of a new 3.85 Wӓrtsilӓ generator at the Prospect Power Station, signals a more reliable source of power, interruptions in the supply are possible. Mr. Swanston, said in his welcoming remarks at a ceremony to commission the largest generator ever installed at the power station, on September 12, 2017, at the power station’s parking lot, that the aging power generators there are in need of major maintenance work and inspections. He said as a utility, NEVLEC is always engaged in a mission of continuous improvement and the management has been working overtime in fulfilling it through service delivery, employee’s engagement and satisfying the growing needs of customers. Prior to the installation of the new Wӓrtsilӓ generator, Mr. Swanston explained that because of aging infrastructure in the generating sets, the challenges were many with few solutions. The Acting General Manager noted that the effective capacity at the power plant was 80 percent, which was due to significant deterioration. As a result, the company was left with insufficient reserve generation capacity to perform any planned or unplanned maintenance. He said the Four Seasons Resort had come to the assistance of NEVLEC in several instances by going offline. It meant increased financial loss in revenue in excess of EC$740, 000 for 2015 and 2016. In the meantime, NEVLEC’s Board of Directors has indicated its interest in devising a way to purchase another engine to replace the aging ones at the power plant.